Today, 54% of the world’s population already live in cities and with a further 3 million people per week moving to urban centres, the UN estimates that 66% of the global population will be living in cities by 2050. This trend is particularly evident in Africa and Asia, which is experiencing an unprecedented transition from predominantly rural to urban living. If managed well, urbanization and city living can have many benefits. Cities provide an efficient way of organizing people’s lives: they enable economies of scale and network effects, and reduce the need for transportation, thereby making economic activity more environmentally friendly. The proximity and diversity of people can spark innovation and create employment as exchanging ideas breeds new ideas. The diversity of cities can also instill social tolerance and provide opportunities for civic engagement. Already today, the linkages between cities form the backbone of global trade and cities generate the majority of the world’s GDP. However, if managed badly, cities can be left choking under the burden of pollution, congestion, sprawling slums and urban poverty. In the developed world, urban sprawl can lead to individual levels of resource consumption far exceeding those in the developing world. Urban settings also magnify global threats such as climate change, water and food security and resource shortages. So if urbanization is set to continue, how can our cities respond? If the future of cities cannot be one of unsustainable expansion, it should rather be one of tireless innovation. Innovative solutions need to be scalable, replicable and capable of being adapted in a variety of specific urban environments. Some solutions will only be possible due to new technologies while other solutions will apply technology to ideas that are as old as the city itself. 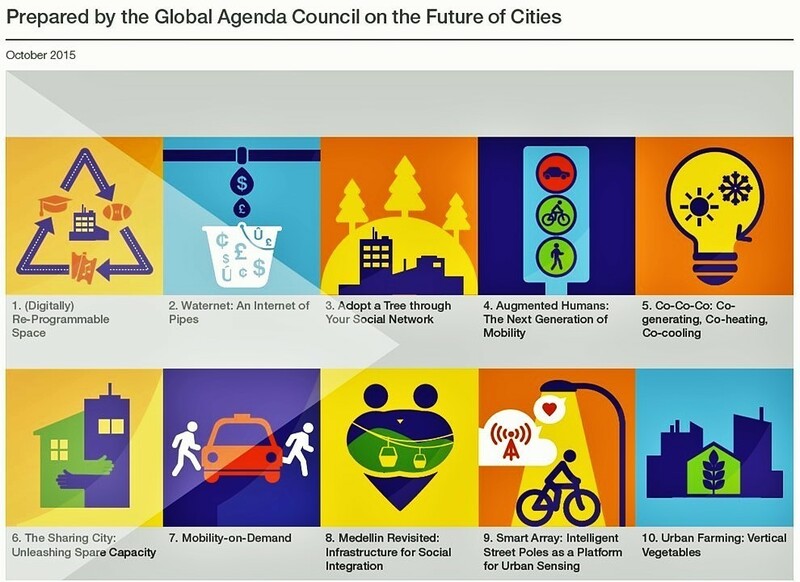 The World Economic Forum’s Global Agenda Council on the Future of Cities chronicled a list of Top 10 Urban Innovations from around the world, that are providing best practice examples of how cities are creating innovative solutions to a variety of urban problems. Unleashing spare capacity: Many innovations cleverly make use of existing yet underutilized resources. Airbnb, for example, enables the renting out of unused private homes; co-locating schools and recreational facilities enables public-private sharing of space; and the circular economy provides opportunities to reuse, recycle and upcycle. Cutting out the peaks: From electricity and water to roads and public transport, upwards of 20% of capacity sits idle for much of the time ready to cope with demand peaks; cutting out these peaks with technology-enabled demand management or innovative pricing structures can significantly limit the burden on financial and natural resources. Small-scale infrastructure thinking: Cities will always need large-infrastructure projects, but sometimes small-scale infrastructure – from cycle lanes and bike sharing to the planting of trees for climate change adaptation – can also have a big impact on an urban area. People-centred innovation: The best way to improve a city is by mobilizing its citizens. From smart traffic lights to garbage taxes, innovations in technology, services and governance are not ends in themselves but means to shape the behaviour and improve the lives of the city’s inhabitants. All innovations should be centred on the citizen, adhering to the principles of universal design and usable by people of all ages and abilities. Cities are expected to provide a better standard of living, increase community cohesion, wellness and happiness while progressing towards sustainable development. To be successful in meeting these requirements, cities need to transform their strategies to include innovation and enable the convergence of the digital and physical dimensions. Cities need to support the design and development of cutting-edge solutions and processes in collaboration with the private sector, scientific research institutions, academia, citizens and start-ups, to maintain the competitive edge, while progressing towards better performance and urban service deliveries.